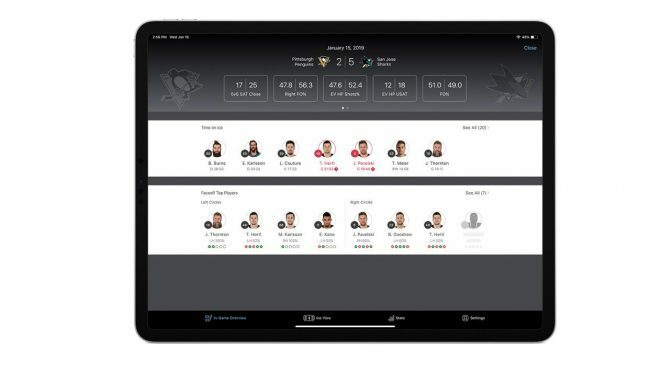 Apple has now followed suit, signing a deal to provide iPad Pros to the NHL for player stats and analytics, as well as for video review for referees. The deal will be in place in time for the 2019 Playoffs, with a league-wide rollout coming for all teams and refs in 2020. Apple isn’t the only one involved in this particular agreement. SAP has worked with both Apple and the NHL to develop a custom app called Coaching Insights. This app will provide 60 real-time team and individual player statistics, giving coaching staffs easy access to the information they need to adjust lineups and strategy on the fly. This deal between Apple and the NHL is an addition to a previous agreement in 2017 that provided 3 iPads on each bench for access to in-game video for review by players and coaching staffs. The new Coaching Insights app will be available on these existing iPads and one additional device will be included on each bench specifically for the app as part of the new agreement. the AP says that Ottawa Senators winger Bobby Ryan was able to review footage of Pittsburgh Penguins goaltender Matt Murray before a shootout, checking his tendencies and technique, while other coaches said they have been able to adjust tactics on the fly by checking film during a game. While the NHL doesn’t have anything close to the visibility of the NFL, this is a good move for Apple to get a foot further in the door of professional sports. With two of the major sports leagues in the US now spoken for, it will be interesting to see if Apple, Microsoft or Google make plays for Major League Baseball, the NBA or MLS in the coming years. It certainly makes sense, as all sports are embracing analytics to help coaches make the most informed decisions possible. There are few tools better than the iPad Pro to deliver this info to coaches and players in real-time on a bench, sideline or dugout, so it wouldn’t surprise me to see Apple press that advantage with other leagues. Previous PostDuckDuckGo Moves to Apple Maps for Mapping-Related QueriesNext PostIs the iPod Touch Poised for a Comeback?